Parents looking for a sporty minivan that offers both excellent passenger space and convenient interior amenities, as well as a fun and nimble driving feel will find a lot to love in the 2015 Mazda5 in Springfield. Unlike many of its competitors, the Mazda5 is a compact offering that feels more like a small crossover than a minivan. Keep reading our 2015 Mazda5 review for even more details on this fantastic family van. 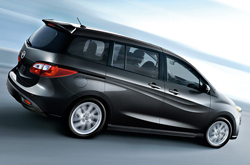 The 2015 Mazda5 comes in three trim levels: Sport, Touring and Grand Touring. Standard features on the base Sport trim include 16-inch alloy wheels, a height-adjustable driver seat, keyless entry, a tilt-and-telescoping steering wheel, 50/50-split rear folding seats and a six-speaker sound system. Opt for the Touring trim and you'll add 17-inch alloy wheels, a rear spoiler, a leather-wrapped steering wheel and shift knob, Bluetooth connectivity, a trip computer, foglights and rear parking sensors. Our 2015 Mazda5 review loves the top-of-the-line Grand Touring trim, which comes with several luxury amenities, including automatic xenon headlights, heated mirrors, driver lumbar adjustment, leather upholstery, heated front seats, satellite radio, automatic wipers and a sunroof. Drivers can also choose between several stand-alone features, such as an auto-dimming rearview mirror, remote ignition and a rear-seat entertainment system with DVD. Under the hood, the 2015 Mazda5 is powered by a 157 horsepower 2.5-liter four-cylinder engine. The engine is paired with a five-speed automatic transmission (the five-speed manual gearbox has been deleted from the features list), with all power routed through the front wheels. Safety features on the Mazda5 include antilock disc brakes, stability and traction control, full-length side curtain airbags and front side airbags. In government testing, the 2015 Mazda5 earned a top score of "Good" from the Insurance Institute for Highway Safety in moderate-overlap and roof-strength tests. The 2015 Mazda5 is now in Springfield. Stop by our showroom at 438 S. Ingram Mill Rd and take this terrific family car for a test drive today! In a variety key areas, the 2015 Mazda5 surpasses class rivals like the 2015 Dodge Grand Caravan, Honda Odyssey, Nissan Quest and the Chrysler Town & Country. 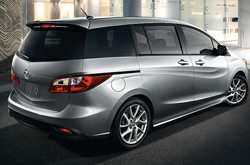 Shoppers will be pleased with the Mazda5's exquisite styling, as well as its progressive cabin amenities. You'll surely see that when compared to the vehicles in its class it's a phenomenal value in regard to price, which is why many Springfield Mazda customers choose it. Catch a glimpse of the Mazda5 bullet list underneath this text for more quick facts. 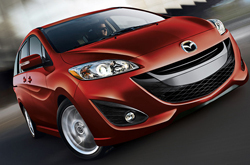 Do you want to know more about the 2015 Mazda5's features and specs? After reading the review above, visit Reliable Mazda and experience the Mazda5 up close. 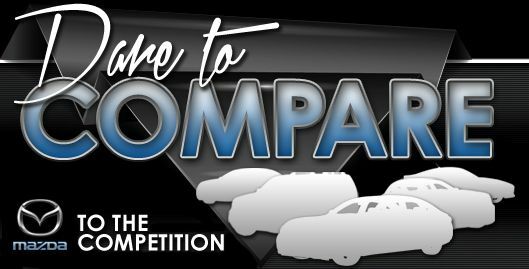 With the help of some of the most exceptional automotive writers in the industry, we've managed to get reviews written for all of our models. As you read this article, you'll see that it is stuffed with up-to-date information about all the things you're looking for in the new Mazda5 - powertrain options and other specs included. Now that you've read Reliable Mazda's Mazda5 review, please message us to schedule a test drive or learn about current financing offers and national OEM specials.